➢➢ “Josh Groban and Tony Danza make an immediately endearing odd couple in this new series from the quirky mind of Monk creator Andy Breckman. Groban plays nerdy NYPD detective Tony Caruso Jr., a conscientious overachiever who doesn’t drink or swear and endeavours to do everything by the book. Danza plays Tony Jr.’s father and housemate, Tony Sr., an old-school rogue cop fresh off a prison sentence for assorted felonies … Groban and Danza are a winning combination, and Breckman, adapting an Israeli television series, gives their relationship some nuance and depth.” — Sydney Morning Herald. ➢➢ “The Good Cop blends the cheerful silliness of Brooklyn Nine-Nine with the tidy storytelling of Breckman’s other crime comedy, Monk, and it elevates the familiar police-show formula with a strong ensemble cast … As a rare Netflix procedural, Good Cop is engaging without being too mentally taxing.” — Entertainment Weekly. ➢➢ “Though the circumstances of The Good Cop are different from Monk, its plot devices, jazzy interludes and sense of pat, shy humour are almost exactly the same, which is good news. Unlike the galaxy of other cop procedurals on air, The Good Cop feels lighthearted and fun — emotions that are practically verboten in (serious voice) these fraught political times and even more so within the genre.” — TV Guide. ➢➢ “The Good Cop is a show that aims for as broad an audience as possible—and in the process ends up becoming a show that it’s hard to imagine anyone calling their favourite. 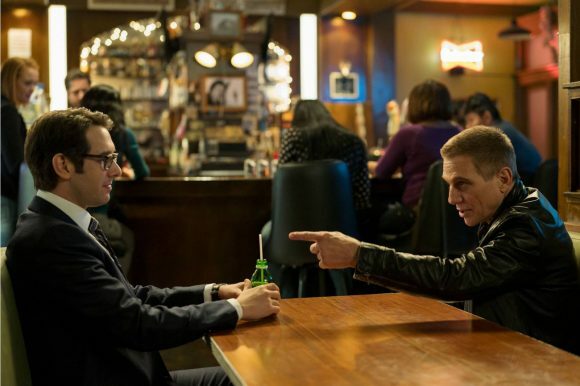 A show with frustratingly little on its mind, The Good Cop quickly establishes its two leads as familiar personality types and then reiterates who they are, over and over, for ten episodes, with little modulation or development.” — Variety. ➢➢ “This is an old-fashioned serial playing on a new-fashioned network. It conspicuously embraces television’s past, where the murder takes place before the first commercial break and the big reveal just before the last. The cop cliches are so broad they almost write themselves … Why this is on Netflix is a mystery bigger than any the Carusos will tackle this season.” — Newsday.